You'll be £24.00 closer to your next £10.00 credit when you purchase The Irish Brigade 1670–1745. What's this? Order within the next 4 hours, 11 minutes to get your order processed the next working day! Irish troops had fought for Louis XIV in the 1670s, under Irish officers who had little choice but to fight in foreign service, with the blessing of Charles II. With the accession of James II, and the religious politics of who might earn the English crown, they became embroiled in the Jacobite succession crisis, fighting in Ireland, then sent to France under Lord Mountcashel in 1689. 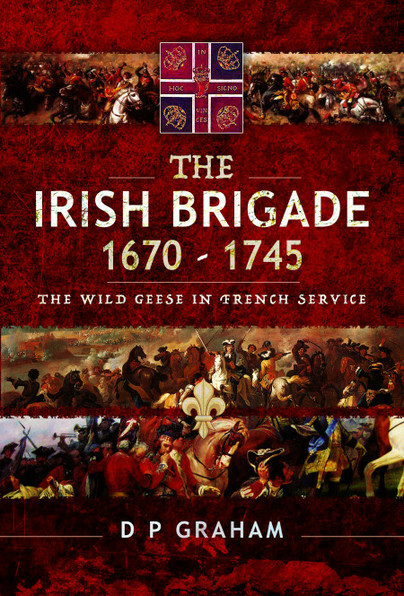 With the fall of Limerick in 1691, Patrick Sarsfield led the second 'flight' of 'Wild Geese' to the continent, to fight in a war for the French, against the Grand Alliance of Europe, in the vain hope that their loyalty might warrant French support in a return to Ireland under a Jacobite king. From the Nine Years War, through the War of the Spanish Succession, and beyond, their descendents would be present at Fontenoy, Culloden and in the Americas, forever destined to fight for a cause and land which had changed beyond recognition. D.P.Graham explains the origins of the brigade and its regiments, the personalities who led them and formed their reputation, and the circumstances of their final dissolution in the aftermath of French Revolution. D.P. Graham has a background in research and is a qualified historian. He has lectured on various aspects of the seventeenth-century Irish Military establishment, as well as its development in mainland Europe and the Wild Geese Irish exiles . He is the author of Enniskillen and The Battle of Newtownbutler and The Hamiltons in Ireland, England and France, 1610-1719. He lives in County Antrim with his wife and two daughters, and likes to ensure that he is never too far away from the sites where the events took place.